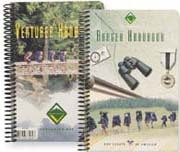 You've found the place to get the latest versions of the Cub Scout, Boy Scout, Venturing and Sea Scout Advancement Trackers, AND the Girl Scout Brownies, Juniors and Cadettes/Seniors Advancement Trackers! Achievement Trackers! Advancements can be a nightmare to track! So Dave Blodgett of Pack 1196 in Manassas, VA, set to work developing an Excel-based Bear Achievement Tracker that was designed specifically for tracking Bear Achievements and Electives. This was the birth of the free Excel Cub Scout Trackers in September 1997. Roxanne Prahser came across Dave's Bear Tracker in the fall of 1997 when she was a new Wolf den leader and her husband was a Bear den leader. She asked Dave's permission to duplicate his work for the other levels of Cub Scouts, which of course, being the wonderful scouter that he is, he gave and our family of trackers began! Due to numerous requests for similar trackers for girl scouts, Roxanne added trackers for all levels of Girl Scouts as well. All trackers are Microsoft Excel spreadsheets and require either Microsoft Excel 2000 or later or another compatible spreadsheet program (for trackers compatible with older versions of Excel, please Email Roxanne and she will send you a version that is compatible with your version of Excel). Note that these spreadsheets are NOT compatible with Microsoft Works - if you do not own a compatible version of Microsoft Excel you must either purchase one or download OpenOffice, which includes an Excel-compatible spreadsheet program. All trackers are compressed in .zip format to reduce file size and decrease download time. If your computer cannot open .zip files, then you must download a .zip decompression program such as Winzip. PDF versions are also available for manual tracking, and require a PDF reader such as Adobe Reader. Check back occasionally for the latest versions. Updates are released as time permits to fix bugs and enhance the trackers. If you have a pop-up blocker, you will need to temporarily disable it to download these files. If you have questions on any of the trackers, please take a look at the Notes sheet first in the file for general information. Still lost? Then please Contact Roxanne for any questions on any of the trackers. Roxanne Prahser is a former Den and Webelos Leader of Pack 215 in Walnut Creek, California, a former Scoutmaster of Troop 277 in Pleasant Hill, California and "used to be a Bear . . ." (WEM 23-98-25). Both of her boys are now Eagle Scouts and she isn't as active in scouting as she used to be, but she continues to maintain the scout advancement tracking spreadsheets because she remembers what it was like to be a new den leader and to try to track achievements. If you would like to contact Roxanne with feedback or to just say hi, please Email Roxanne. She would love to hear from you.